Eggplant is a useful tool in reducing the risk of cancer. Research shows it aids in the prevention of brain tumors and in the treatment of colon cancer. 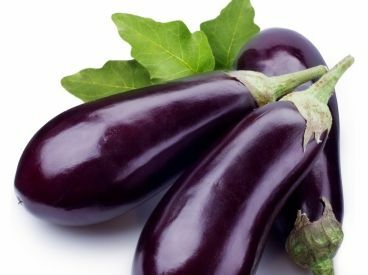 The fiber found in eggplant absorbs toxins and chemicals that lead to the development of colon cancer. Be sure to eat the skin. The skin is believed to have the highest concentration of this fiber. The potassium found in eggplant helps to regulate blood pressure. I personally take prescription potassium and that is one medication I will not let myself skip. When my potassium level is low I suffer from cramping. Chlorogenic acid, a powerful antioxidant offering antimicrobial and antiviral activities, helps lower bad cholesterol levels. A high level of this antioxidant is found in eggplant. High in B Complex Vitamins, eggplant keeps us thinking clearly and lowers stress. High in fiber also means low in constipation. Eggplant contains a small amount of nicotine so it may even curb that craving for a cigarette! Picture from a scene in the movie Coneheads. Prymatt (played by Jane Curtain) shrieked when she thought baby Coneheads were being sold at the market. trying to lose weight. It is low in calories and high in fiber. The fiber curbs your appetite, allows you to feel full longer and improves your happiness. It is simple math, really: Feeling full = eating less = weighing less = Happy Person! Like us, eggplant contains a lot of water. Water is important to healthy skin and hair. Research shows that consuming an adequate amount of water through the foods and beverages we ingest daily can reduce the number of fine lines and wrinkles that appear as we age. The water content diminishes with cooking, so eat the eggplant raw for the best results. *Coneheads is a 1993 comedy starring Dan Aykroyd and Jane Curtain.